We are offering 40 HP High Pressure Air Compressor to our clients. 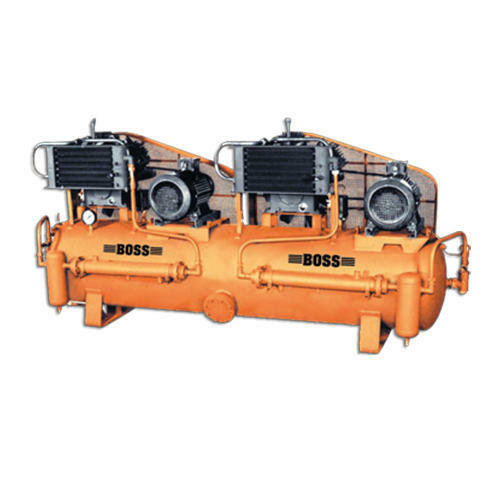 Growing in the market since 1985, our firm Boss Air Compressors is well known in the market. It is a first generation entrepreneurial venture for the large range of industrial machines. This is made with an aim to offer the consumers superior quality machinery which are built with international production standards. With our production unit spread over an area of 80,000 sq. Ft we Manufacturer, Exporter, Importer and Trader of Industrial Air Compressor, Automatic Roll Forming Machine, Kluber Screw Compressor Oil, Refrigeration Compressed Air Dryers, Pressure Car Washer an much more. Our work doesn’t end up to the manufacturing of these branded products but also, we guide our customers to use these machines easily to get high production rate in quick timing with lesser energy consumption. Professionals of our firm always keep themselves up to date with current and changing technology in the respected field. We always try hard to present best quality products to our precious customers to assist their commercial needs in more convenient way. We have dealt with trustworthy vendors of raw material to bring hardness and other quality features in our developed machinery. We have installed best machinery at our firm to give elegant finishing and reliable working to all these produced machines. As a result of our immediate and co-operative services over the decades, we have managed to significantly expand our clientele base in entire Indian market.